Since my twins started their life in primary school this week, there will be a slight change in my lifestyle from now onwards. Change in my lifestyle as in baking. Usually, by the time I reached home, the kids will already be home and had taken their dinner. However, since school has started, they will reach home much later than me. Now, I go home to a quiet environment. No longer having them to greet me at the door sometimes. Somehow, I just missed their noise, their laughter and their bugging. Last December, I went to Robinsons to buy a 9" Kaiser Bundt pan. Bundt seems to be quite the in thing now. It comes in different materials, including silicon ones. I've been dying to bake in such a pan. I found that if it's baked well, the cake can turn out to be really pretty, like this cake from Gina. Anyway, the sides were slightly oily (thanks to the greasing). And I found the cake too sweet despite reducing the sugar already. If you want to try the recipe, do reduce the sugar to a total of 150g. I used a total of 200g and still find it sweet. Probably because of the chocolate rice I added. The funny thing is, when I printed the recipe, I didn't realise that steps #5 & 6 were missing from my printout! So instead of folding the egg white into egg yolk mixture, I fold in the flour first, followed by the chocolate rice and walnuts, then fold in the egg whites. That was quite a tricky part. In the end, I got myself a more airy cake, as compared to the original cake that Wen posted. I would very much preferred her texture, more dense than airy. Anyway, it's a learning experience. 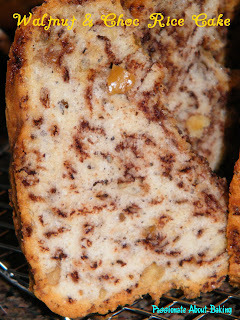 I still like the taste of the cake, with the walnut giving it a crunch! You've got a nice cake there! Can you teach me something? First, I bought kind of this pan from Tang before xmas and haven't got a change to use it, now only I know it's called Bundt pan. Do I need to grease the pan before fill in the batter? Is the pan only for baking butter cake and pound cake? How about chiffon cake? Your cake nicely baked and rise up quite high. 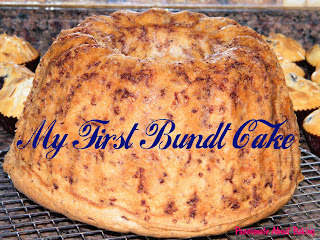 I like it very much and really want to try out the bundt pan soon. Thanks for sharing Jane! Hey Jane. Your kids are adorable! It's so sweet that they can literally be by each other's side when they're taking such a huge step ahead. How are they coping with school so far? Ur cake looks very delicious and nicely done. Aw, I'm also very new to Bundt pans. :p However, I'll share with you my experience. Like any other cake pans, I think you have to grease it. Otherwise the cake might not fall off after you baked. I think I've put in too much oil, which resulted in it being quite oily when I removed it. But some "browned" crumbs still get stuck to the pan, so I don't have a nicely brown cake throughout. Thanks very much for you concern. They are slowly adjusting to their new lifestyle, though I think now they would prefer their childcare life. My girl said school is too long. Poor thing. I got myself a Philips s/s handheld food processor (3-in-1) quite a while back. I thought it was really useful because it comes with a small food processer, a whisk and a blender. Mine is something like this: http://www.consumer.philips.com/c/juicer-blender/hr1364_00/prd/sg/" but in stainless steel. I bought it from Mustafa for about $83. There are similar ones from Kenwood too. You can go around and find out more. Then wait for the post-CNY sales! Hope this info is useful for you. Jane, I also sell this Bundt pan leh! I even have the smaller one. Its non stick so you DON'T need to grease the pan. I don't know how much you paid for yours. But mine is from Germany and selling it at S$8.90 for 9 inch bundt pan. Plus, with KC card, you get an additional 10%. One other thing, if the recipe has butter or oil, you actually do not need to grease the pan. The oil from the cake will loosen it once its baked. Aiyo. I bought it when I saw it and totally forgot that you had it. :( I knew you sell them, and had wanted to go and buy, but just slipped my mind. Oh, so don't need to grease the pan arh? It will still come out nicely? Ok, I try next time. :p Thanks very much for your advice. Jane, I never grease any pan especially when its non stick and the batter has oil/grease. I don't even lined my pan with paper even if its sponge cake. But I usually bake sponge cakes in non stick pans. Once cooled, it slips out easily. So thus, I never had baking parchment paper at home. Not even with cookies. Cool! I'm typically quite ks. I'll lined with paper, but avoid gresing tho'. Oh, you can get the sponge out without prob? I can't. Hehe... Next time I try. Thanks very much for sharing. Thanks Jane! That's very helpful. I agree with you about using this bundt mould for chiffon. I think it's quite impossible. 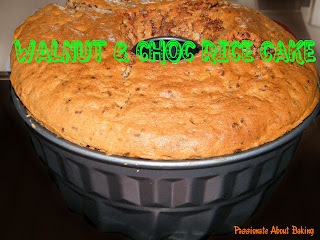 Anyway, will try it soon with some butter cake recipe. Thanks Jane!